This event has been running for 35 years, and this year would be my 4th time running it. It used to be my own little secret race, but it seems the secret has gotten out! 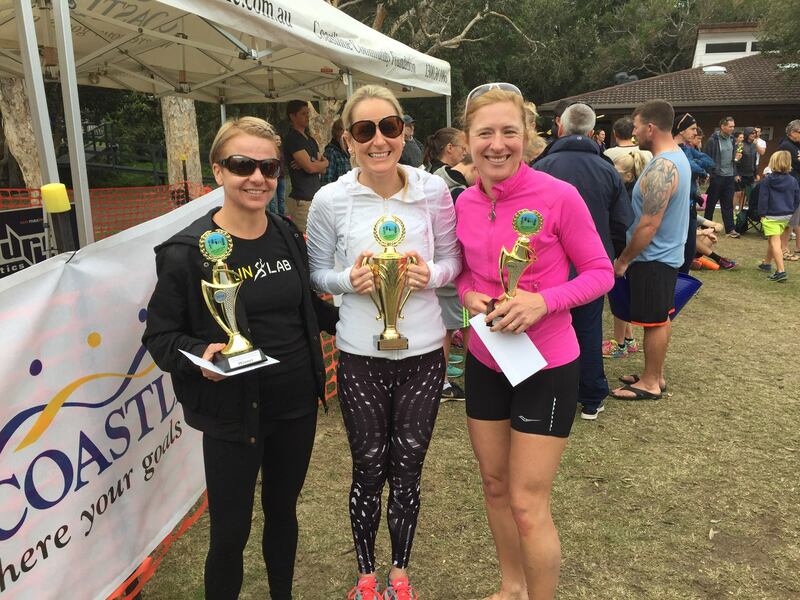 It seems the word has spread that the local triathlon club put on a great little race, on a long weekend, in a beautiful spot, that is reasonably priced and well organised. This year, a large group of runners made the trip up from Newcastle to run this race, most of them staying in the local caravan park. For this race, my family usually come up and we all stay at my Nan’s house in Kempsey, and this year we didn’t break the tradition. Aunty Rob cooked up a delicious middle-eastern inspired feast for everybody. It is safe to say I was very well loaded up on koftas, labna and spiced chickpeas, yum! Sunday morning was an early start to drive out to South West Rocks, so I ate my breakfast on the way. When I arrived, I picked up my bib number, dropped 6 personal drinks into the boxes to go out onto the course, and was pleased to find some friendly faces. The inaugural marathon here, 34 years ago, saw 11 runners make the journey from the Kempsey swimming pool all the way out to the Trial Bay gaol, near South West Rocks. Long before the days of Garmins, Gu’s and GPS, runners used to hit the wall – literally – hit the wall of the gaol, which marked the end of the run, 42.2km from the start, or as close as you could get in those days, without modern technology. Today, the event, run by the local triathlon club, offers a full race program including the marathon, half marathon, 10km and 5km events. 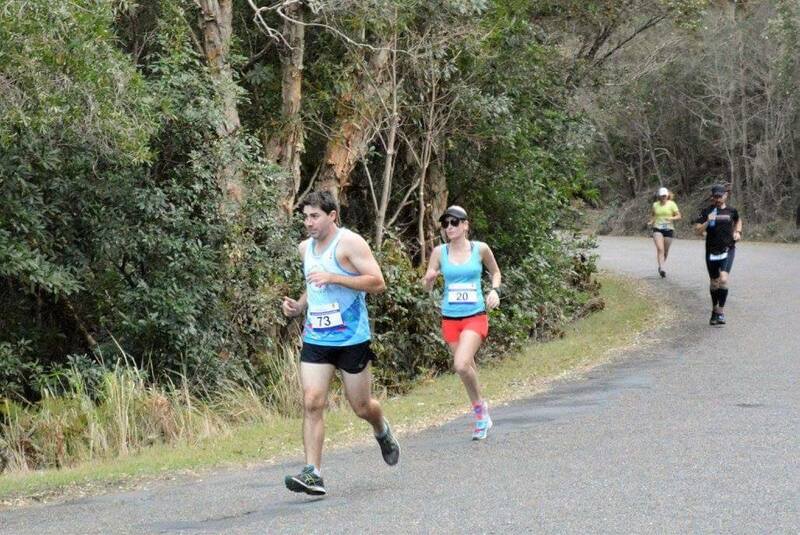 The course is an out and back course starting and finishing in the caravan park next to Trial Bay gaol. With a few minutes to go, we all bustled our way into the starting chute. The starting horn sounded, and put we all charged. It was a cool morning, but would not take long to warm up. We ran up and out of the caravan park, and then down the hill, and along the path into town. The marathon course wound its way up and down, through the shady beach paths. Soon I was running next to Rick Patzold, who had to be close to his 200th marathon by now. I had lost Helen and Jen already, but they would not be far behind. Ahead I could still see Shayne, in the lead for the girls, and another lady I didn’t know. At about 7:30, I was running through town. The half marathon would be starting. I turned and crossed the road, and headed out of town. Soon enough, I crossed the Jerseyville bridge. The half marathon turnaround was not far after that. Now it was time for the long and boring part of the course… 10km straight and flat out to the Hat Head turnoff at Kinchela, and 10km back. The field had dramatically thinned out by now, and a nasty headwind was starting to blow. I ran through an aid station and picked up a pop top of Gatorade. I had a gel. For the next 5 km I passed no one, and no one passed me. I considered dropping back to run with my friends, but I was not going fast, just cruising along, so I thought that they would catch me soon enough anyway. The headwind was getting nasty now. I felt like I was running uphill into a brick wall. The race leaders passed, going back in the other direction. I couldn’t wait to make it there, hoping the wind would ease once I turned. A couple of kilometres later, I made it to the turnaround. It was not long before I ran back past Helen, Jen and Neil, all running together and having a good time. Sadly, the wind still felt stronger than I hoped it would. I headed back towards town, It was a long and lonely road. It was starting to heat up, and there was no shade. I missed one of my personal drinks at one of the tables. I was pleased to hear after the race that it still went to good use: Maree had come through that station after me, and her own personal drink was not there. Knowing I was ahead of her and had already passed through, and seeing my name on one of the bottles of Gatorade, she proclaimed ‘She won’t be needing that!’, and made sure it was put to good use. Eventually, I made it back to Jerseyville. There was about 10km to go. I was chasing the shade along the side of the road. As I made my way back into town, I decided that this race was not flat at all! With about 6km to go, the course switched from road to footpath, and wound its way through the trees again. I was thankful for the shade. I started to pass a couple of the half marathon stragglers, and knew the end was close. I ran as hard as I could up the last hill. As I turned the last corner, I could hear the finish line before I could see it. and as usual, crossing it is always a good feeling. 3:28:27 was my time, which was good enough for 3rd place. 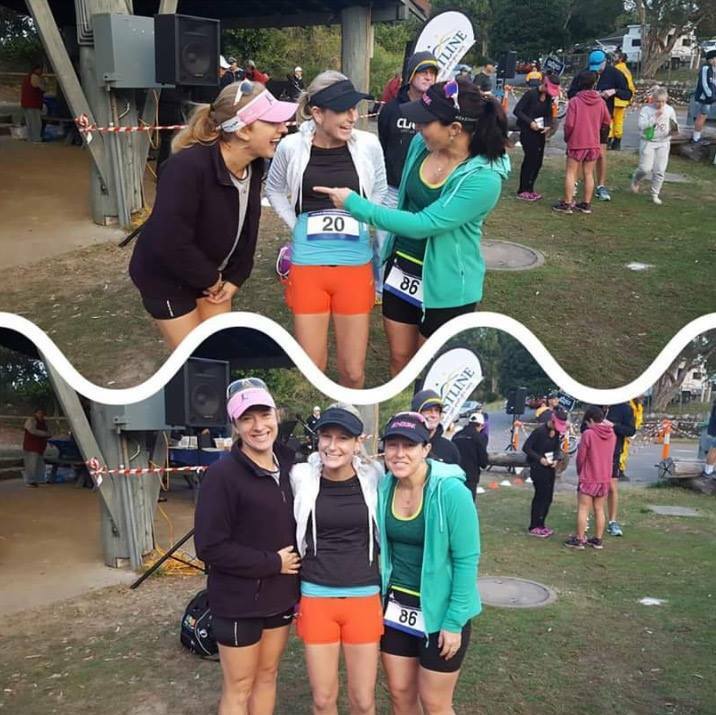 I made the most of the post-race massage-by-donation for the Fred Hollows Foundation, showered and hung around for the presentation. 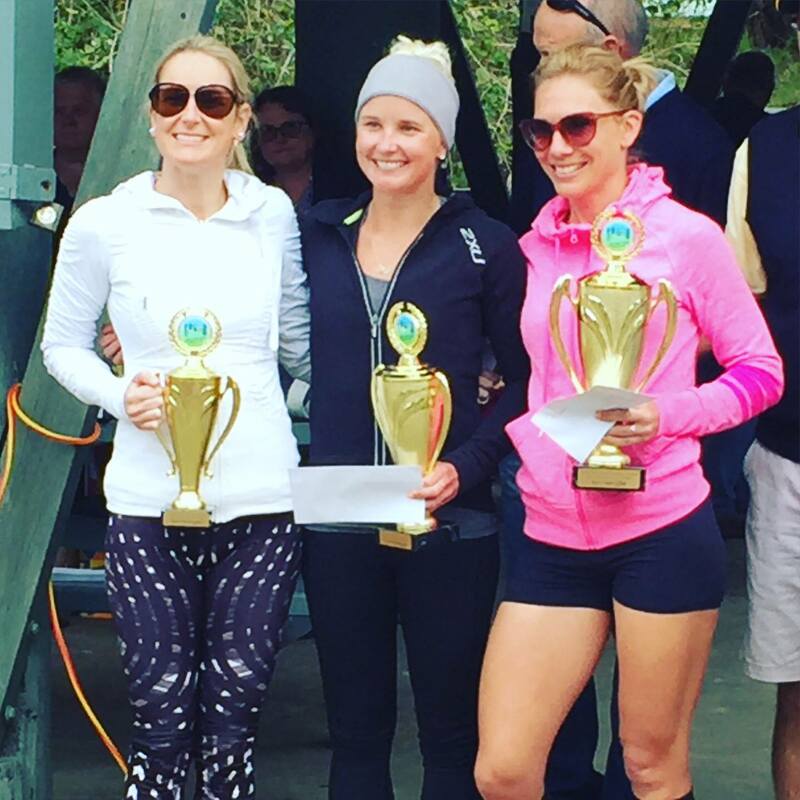 Blonde Trifecta on the podium! The Newy girls clean up! Afterwards, we all headed back to the caravan park, to enjoy some well-earned post-run beverages, and make the most of the remainder of the long weekend. Maybe next time, we will camp with everyone else. Maybe. If they move the race to summer. I guess you better book us in again for next year, Nan!